We recently signed up for the 1GB bandwidth from our ISP. We have 4 kids, plus my wife and I, TV's, etc. and based on the package options that seemed the best route. I believe we are getting well below the proper speed (around 500 MB average). 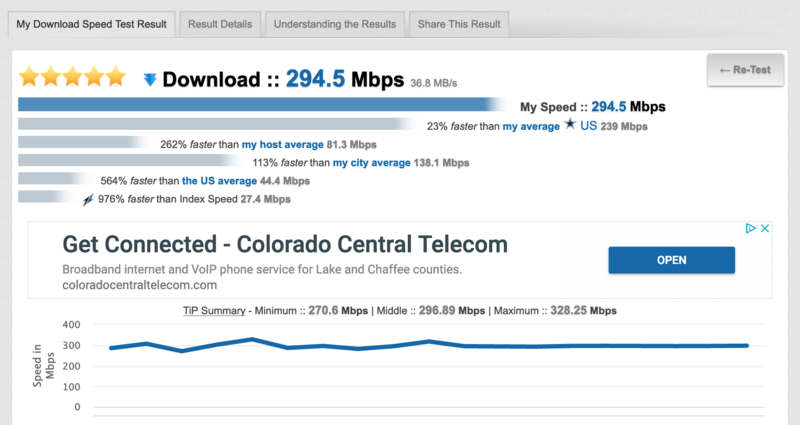 I want to do a speed test, but many say they are note reliable/not designed for high speed internet. Does this site speed test work well with high speed internet connections? If so I'm going to let it run for a day and get a variety of readings to come back with. Since day one, this has been designed for all broadband. The server-side is always connected with a minimum of 1000 Mbps. There are many servers in rotation at all times, especially if you select Dallas under Test Servers. You're usually testing on a server with nobody else testing, connected with 1000 Mbps or greater. Works awesome on my connection. Even when the server is thousands of miles away. If my connection were running better the multithread and single thread results would be right on par with each other. Is that a gigabit like Comcast wants me to believe? No. But those are the speeds I'm actually able to download at. I'm not complaining. Gigabit is new here and they're still building it out. Could I complain and get a credit... probably. Upload is right where it's supposed to be. The connection is also really stable. Run an automatic speed test if you want to gather your test history over time automatically.